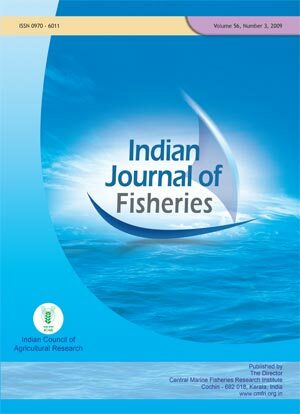 The Indian Journal of Fisheries is published quarterly by the Indian Council of Agricultural Research (ICAR). Original contributions in the field of fish and fisheries science will be considered for publication in the Journal. The material submitted must be unpublished and not under consideration for publication elsewhere. Papers based on research which kills or damages any species, regarded as threatened/ endangered as per IUCN criteria or is as such listed in the Red Data Book appropriate to the geographic area concerned, will not be accepted by the Journal, unless the work has clear conservation objectives. Please read the following instructions carefully before placing the order. 1. Prices in Rupees are applicable for sale in India only. 2. For all others including international organizations, customers prices in US $ are applicable. 3. Payments must be made only through a Demand Draft or banker’s pay order payable at Ernakulam Branch. Cheques are not accepted. 4. The Demand Draft should be drawn only in favour of ‘ICAR Unit-CMFRI’ payable at any nationalised bank at Ernakulam and sent to the Director, Central Marine Fisheries Research Institute, PostBox No: 1603, Ernakulam North P.O, Cochin - 682 018,India. 6. No publication will be sent by VPP. Krishi Anusandhan Bhavan, Pusa, New Delhi - 110 012.